The island of Sri Lanka is situated in the Indian Ocean, off of the coast of India, just 7º00´ North of the Equator. This island nation therefore experiences a tropical climate, meaning it is hot and humid all year round with distinct wet and dry seasons. Sri Lanka is subject to two different monsoon rainy seasons affecting opposite poles of the island, which results in a high average annual rainfall. Around 1250mm (49.2ins) falls each year in the north-west and south-east of the pear-shaped island, with an annual average rainfall of 5000mm (197ins) in the mountains of the southern central region. The mountains affect the annual average temperature too, because at high altitude conditions are generally cooler, with greater seasonal differentials, than the steamy constant year-round highs experienced on the coast. The north of the island is the hottest region, where temperatures have been known to peak at 40°C (104°F), while in the mountains the town of Nuwara Eliva, lying at 1889m (6197ft), has an annual average temperature of 16°C (60.8°F). Humidity levels in Sri Lanka typically range between 60% to 90% and are generally higher in the south-west and central highlands. Sri Lanka’s weather patterns are made rather complex by the two monsoon seasons. The Yala monsoon occurs between May and August, swamping the south-western part of the island with heavy rain. This is followed by a dry season in that region between December and March. The Maha monsoon brings wet conditions in from the Bay of Bengal to the north-east of Sri Lanka between October and February, dumping torrential rains on the north-east facing slopes of the mountains around Kandy. Here the dry season is between May and September. The capital city of Sri Lanka, Colombo, is located on the island’s west coast, an area which receives rain from both of the monsoons. Sri Lanka is at risk of cyclones and intense tropical storms, which have been known to lash the island during the months of December and January. From the description of the various monsoon seasons above, it will be apparent that it is a complicated matter to time a visit to Sri Lanka to avoid a rainy season. The upside of so many variations is that there is somewhere on the island all year round offering good holiday weather. Even during the monsoon seasons the rain need not dampen the spirits of holiday-makers, because there is a great deal of hot sunshine between the short, heavy rain storms and conditions change rapidly. Peak tourist season in Sri Lanka is regarded as being between December and April, with the driest time of year across most of the island being during the inter-monsoon periods from mid-March through April, and again in August/September. Dry days are never guaranteed in Sri Lanka, though. What to pack for a holiday in Sri Lanka? Despite the heat, young Sri Lankans wear jeans even in the heat, so visitors from hot areas are right at home. However, for others, pack lightly, with light coloured and lightweight clothing made of natural fabrics; cotton is cool in the heat. Sunscreen, hats and sunglasses, as well as any other sun protection are necessary. Keep clothing conservative: wear shorts below the knees or long light trousers; short-sleeved shirts instead of T-shirts; and save swimwear for resorts and beaches. Comfortable footwear is essential and good walking sandals go a long way; amphibian-walking shoes are also recommended. Remember to dress modestly, especially when visiting temples. Take along mosquito repellent and a few long sleeved shirts or trousers for adventure treks. Carry basic medical supplies and a water bottle with enough fresh water for the day. Note: A relatively dry month in Sri Lanka, there is an average of eight hours sunshine a day during January, with high temperatures and humidity on the south and west coast, slightly cooler in the highlands. The wettest region of Sri Lanka in January is the north-east coast, where the Maha monsoon is bringing frequent deluges. Note: The hot and humid southern and western coast of Sri Lanka sees minimal rain during February, and the Maha Monsoon is waning (though the behaviour of the monsoons can be unpredictable), leaving the north and east drier too. Inland in the hills and highlands rain is more prevalent, and conditions are comfortably warm. Note: March is an inter-monsoon month in Sri Lanka, making this an excellent month to visit all the country’s regions, but expect the mercury to hit the high spots. On the north and east coasts the hot sun dries up the last of the monsoon, and the wet season has yet to move in to the south west, although in all areas rain showers are always possible in Sri Lanka. It is a good time to visit tea plantations in the hills. Note: April in Sri Lanka starts off relatively dry across the country, but as the month wears on the frequency of heavy rain showers and the relative humidity increases along the western and southern coast and in the central highlands. To avoid the onset of the Yala monsoon this is the time to enjoy the beaches of the east coast. Note: Moisture laden winds blow into south-western Sri Lanka during May, resulting in frequrent heavy downpours. The north-east, however, is protected from this seasonal onslaught by the mountains, and remain relatively dry. There is no let up from the ubiquitous heat and humidity of the tropics, except in the highest reaches of the mountains. Note: The best place for a holiday in Sri Lanka in June is on the beaches of the east coast, which remain dry, hot and bright while the coast of the south and west continues to be soaked by the Yala monsoon rains. Alternatively head for the hills – in the mountains it is cool by day and even chilly at night. Note: The Yala monsoon makes the western and southern coast of Sri Lanka very wet, hot and humid during July, but the east coast is perfect for beach-going, with dry, bright weather predominating. This is a good month to visit the “Cultural Triangle” in the interior with its ancient archaeological attractions, because although it is blisteringly hot, with occasional scorching winds, rainfall is at a minimum here. Note: August is one of the few months of the year during which visitors can take their pick of Sri Lanka’s beaches. The monsoon tails off along the south and west coast, and the north-east monsoon has yet to set in on the opposite side of the island, beyond the south-central mountains. The driest, and hottest, part of Sri Lanka in August is the interior region around Kandy. Note: Almost reluctant to quit, the south-west monsoon usually has a final burst during September in Sri Lanka, bringing high rainfall to the south and west coastal region. Fortunately it is still comparatively dry on the north-east coast, but not for long, because the north-east monsoon is on its way. In the interior the mountains are fairly wet, but the arid inland plain around Kandy is still a sunny option. 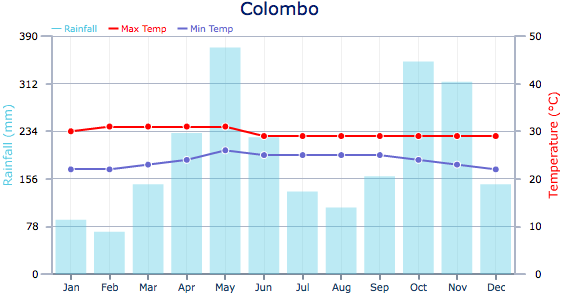 Note: It is all change weatherwise in Sri Lanka in October, as the south-westerly Yala monsoon tails off through the month, accompanied by an ever so slight drop of temperature along the south-west coast. Expect some spectacular bursts of rain here nevertheless, and some fair downpours in the high tea country. Conversely the north and east coast ushers in the arrival of the Maha monsoon with evermore frequent heavy showers. Note: During November the south and west coast of Sri Lanka dries out, giving way to sunny, hot days, but on the south-west facing hills and mountain slopes the rainfall hangs in and temperatures can be chilly in the evenings. The north and east coast, by contrast, become wetter as the second monsoon of the year hits the region, the rain penetrating inland to make conditions in the Cultural Triangle rather damp too. Note: It is peak tourist season in Sri Lanka in December, although the north-east monsoon brings frequent short, heavy downpours to the north and east coast of the island. Optimum beach conditions prevail on the south and west coast, however, but beware the high temperatures and UV index under the scorching sun. The hill country is wet and cool, with chilly evenings.